PES began deploying advanced metering technology in Giles County in 2008. From time to time, PES customers ask questions about their meters. “What is an Advanced Meter?” “How does Advanced Metering benefit me?” Over the past ten years, the deployment of Advanced Meters has brought PES customers numerous benefits. An advanced meter sends a wireless communication hourly from the customer’s home to PES. PES meter techs no longer make their monthly visit to read your meter. With Advanced Metering, the reads can be monitored at the PES office. As an added bonus, PES customers have access to this data also. While PES does not need to come out every month we do still need to access the metering location periodically. Please remember to keep the meter location free of obstacles and bushes. Advanced Meters improve system reliability and reduce response time. PES dispatch is notified when an outage occurs immediately and can more quickly determine the extent of the outage. This benefit allows PES to better dispatch crews. PES still encourages you to call us or use SmartHub to report your outage. Your information can help PES pinpoint the cause of the outage. Advanced metering gives PES customers detailed information about their energy use. PES customers who monitor electric usage daily may avoid the shock of a high bill. Advanced Metering can help identify a problem now instead of when you receive a bill the following month. 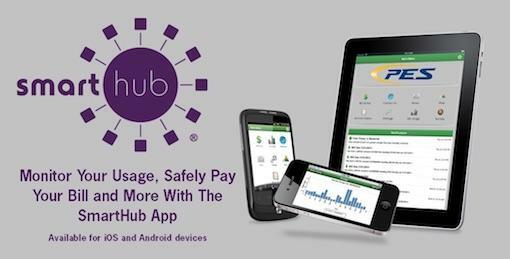 Monitoring usage is made easy by accessing your account on the SmartHub app or online. Once you determine an average kWh hourly and daily usage for the season, you can set up a Power Usage Alert. This notification will send a text or email to let you know when your electric consumption exceeded the maximum. Advanced Metering and SmartHub technology allow PES to improve the reliability of service and transparency for its customers.